Popular amongst the VIP's and Bachelor Parties, Panama Yacht charters deliver the excitement you seek from Latin America. Port from the Amador Causes way and Set sail to nearby Islands, The Panama Canal and Pinias. Panama Yachts Can be chartered on an hourly, daily and weekly rate and are great for Parties at Sea. 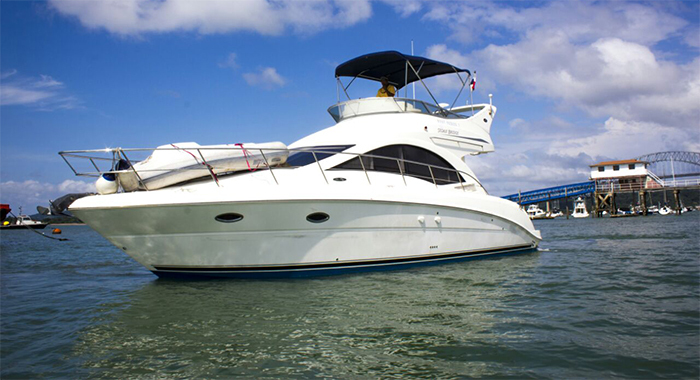 Our Largest Yachts in Panama can accommodate up to 40 passengers complete with Captain, Crew and Chef! Bring as many girls as you like and enjoy your day at sea. Sail the high seas with ease and enjoy the breathtaking views of the Panama Canal, Bridge of the America, neighboring Islands and Panama City Panama. Great for parties, bachelor events and more our daily yacht excursions are available for as little as 4 hours to weekly rentals. Yachts in Panama are hard to come by so take advantage of any opportunity you find to charter one of these large vessels which is sure to make your vacation experience one to remember. Panama Yacht Tours can start at any desired time and all our charters come complete with crew, captain and catering the 3 'c' necessary for the high seas!